Consider the co-diagnosis of bronchiectasis in patients with suggestive symptoms. The Global Initiative for Chronic Obstructive Lung Disease (GOLD) published a management strategy document in 2011, which comprised a set of recommendations for management of COPD based on a comprehensive review of current scientific evidence. GOLD has subsequently updated this document to incorporate new evidence, with the latest update published in 2014.3 Other guidance relevant to the UK was published by NICE in 2010: Clinical Guideline (CG) 101 Chronic obstructive pulmonary disease is scheduled for review in June 2016. 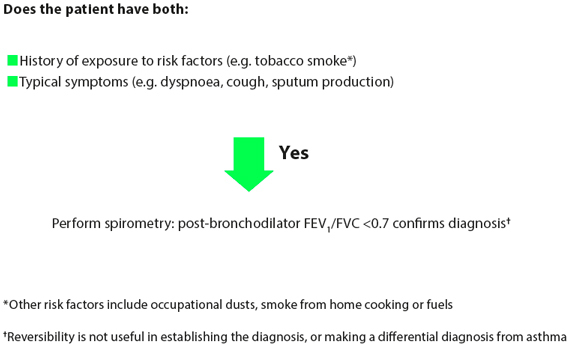 Prior to publication of the GOLD strategy document in 2011, the severity of COPD was graded using only the severity of airflow limitation measured by the forced expiratory volume in 1 second (FEV1).1,3 The 2011 advice from GOLD recommended a multidimensional assessment of COPD, to encompass the level of symptoms, risk of future exacerbations, and the presence of co-morbidities in addition to the severity of airflow obstruction.3 This article will explain the important aspects of the 2011 strategy document, focusing mainly on diagnosis, assessment, and the management of patients with stable COPD, as these are key areas for COPD management in primary care. The 2014 updates that are most relevant to clinical practice will also be considered, with a particular focus on inhaled pharmacotherapy as this is a rapidly changing field with the recent introduction of a number of new medicines. the presence of airflow obstruction on post-bronchodilator spirometry. How to make a diagnosis of COPD is explained in Figure 1. A common mistake in clinical practice is to make a diagnosis of COPD based on only one or two of these criteria. Importantly, older patients with airflow obstruction and symptoms should not be diagnosed with COPD unless they also have a history of exposure to risk factors. Good quality spirometry is essential, otherwise interpretation of the results can become difficult; for example, the forced vital capacity (FVC) needs to be properly completed, otherwise a low FVC causes the FEV1/FVC ratio to be misleadingly high. The results of bronchodilator reversibility should not be considered when making the diagnosis; both asthma and COPD patients can show reversibility, and a positive result does not favour the diagnosis of either condition. FEV1=forced expiratory volume in one second; FVC=forced vital capacity. The multidimensional assessment of COPD includes symptom assessment. The modified British Medical Research Council (mMRC) Questionnaire is a short and easy way to quantify the degree of breathlessness.4 Alternatives are the COPD Assessment Test (CAT)5 and the Clinical COPD Questionnaire (CCQ),6 which again are short and easy to complete, but provide more comprehensive assessments of health status. Any of these tools may be used. The combined COPD assessment uses spirometry, symptoms, and exacerbation risk to categorise patients into groups A, B, C, or D, for the purpose of individualising treatment decisions (see Figure 2). Patients with more symptoms (mMRC ≥2 or CAT ≥10) are categorised as group B or D. Patients with greater future risk (of exacerbations, hospitalisation, or death) are those with FEV1 <50% predicted, or those with frequent exacerbations, and are classified as group C or D.3 There is often a different risk categorisation when evaluating exacerbation history and FEV1, as one of these may predict low risk while the other predicts high risk; in these cases, the patient should still be categorised as high risk. Adapted from GOLD. Global strategy for the diagnosis, management, and prevention of chronic pulmonary disease. Updated 2014. The pharmacological management of COPD focuses on alleviating symptoms, improving health status and exercise tolerance, and preventing exacerbations. The majority of drugs for COPD are delivered by inhalation, in order to maximise therapeutic benefits while minimising side-effects. There is a wide range of inhaler devices available to patients, and it is important to consider ease of use and cost when deciding which drug to prescribe. There are an increasing number of publications concerning the benefits of combination inhalers containing a LABA and LAMA compared with longacting bronchodilator monotherapy.10 The GOLD 2014 update states that LABA/LAMA combination inhalers significantly improve lung function compared with monotherapy, although the benefits to patient-reported outcomes such as breathlessness have been limited.3 Publications regarding the once-a-day combination of indacaterol and glycopyrronium QVA149 were reviewed,3 but there have subsequently been more publications with this drug and the once-daily combination of the LABA vilanterol with the LAMA umeclidinium. The evidence base in this area is rapidly changing, with results showing a common pattern of large improvements in lung function with LABA/LAMA combinations compared with monotherapy, coupled with greater improvements in symptoms measured by questionnaires and significantly lower reliever medication use; overall, this indicates clinically relevant symptomatic benefits for LABA/ LAMA combinations compared with monotherapy. Smoking cessation interventions remain an important part of COPD management, as success can alter the natural history of the disease. The use of pharmacotherapies for smoking cessation should be as part of a structured programme that includes support such as counselling. The management of stable COPD includes reducing exposure to risk factors such as smoking, encouraging physical activity, providing pulmonary rehabilitation for appropriate patients, and vaccination. Regular follow up is required to monitor lung function, symptoms, exacerbation history, and the possible development of co-morbidities. The use of inhaled medicines should be tailored towards the patient's symptoms and exacerbation history. This personalised approach uses the A, B, C, or D categorisation to guide the choice of treatment (see Figure 2). Patients categorised as A or B do not suffer with frequent exacerbations and so do not require corticosteroid therapy; these patients require short- and longacting bronchodilators, according to the level of symptoms. The new combination LABA/LAMA inhalers are a treatment option for GOLD B patients, offering potential cost savings compared with using separate LABA and LAMA inhalers, in addition to a simplified treatment regimen. Patients with COPD who are not frequent exacerbators include GOLD A and B, and also the GOLD C and D patients who have FEV1 <50% but are not frequent exacerbators. For all of these COPD patients who are not frequent exacerbators, a possible treatment algorithm is shown in Figure 3. For patients who become frequent exacerbators despite treatment with a long-acting bronchodilator, ICS/LABA combination therapy is an option. The long-term side-effects of ICS include osteoporosis, diabetes, and cataracts, and there is evidence that some COPD patients treated with ICS develop pneumonia.11 It is important that ICS/ LABA combination treatments are used only in GOLD C and D patients with a history of exacerbations, where the benefits of these drugs outweigh the potential risks. The different pharmacological options for the prevention of exacerbations in frequent exacerbators are shown in Figure 4. 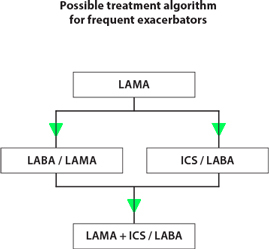 There is less evidence currently for the efficacy of LABA/LAMA combination inhalers in this COPD phenotype.10,19 Nevertheless, a practical approach to the treatment of frequent exacerbators could be to use either LAMA/LAMA or ICS/LABA for patients who are frequent exacerbators despite LAMA monotherapy. Those patients who subsequently still require additional therapy could then step up to 'triple therapy', comprising ICS/LABA plus LAMA. 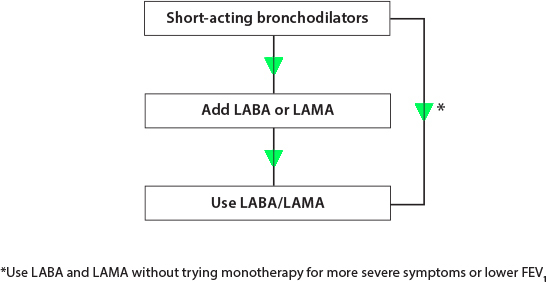 LABA=long-acting beta agonist; LAMA=long-acting muscarinic antagonist; LABA/LAMA=combination inhaler containing LABA and LAMA Adapted from: Singh D. New combination bronchodilators for COPD: current evidence and future perspectives. Br J Clin Pharmacol 2014 Nov 6. doi: 10.1111 /bcp.12545. [Epub ahead of print]. Common co-morbidities in COPD include cardiovascular disease, osteoporosis, depression, and lung cancer. These may arise independently of COPD, or be related to COPD. Regardless of the relationship to COPD, the treatment should be the same as for patients without COPD. The recent introduction of new inhaled medicines for the treatment of COPD offers more choices for patients and prescribers. In particular, LABA/ LAMA combination inhalers provide a logical and effective new treatment option.10 These new medicines need to be used as part of a treatment pathway that considers clinical benefit, potential side-effects, inhaler device characteristics, and cost. There are many patients with COPD in the UK treated with triple therapy (ICS/LABA plus LAMA), who are not, and have never been, frequent exacerbators; the cost of such treatment is high, and there are potential long-term adverse effects of ICS use. The updated advice from GOLD recommends an individualised approach to pharmacotherapy, based on the classification system shown in Figure 2. 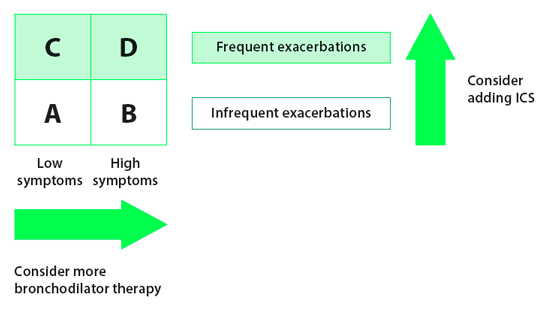 A simplified approach for doctors treating COPD patients could be to identify frequent and infrequent exacerbators, and then to follow the treatment algorithms set out in Figure 3 (for infrequent exacerbators) and Figure 4 (for frequent exacerbators). This individualised approach can be used to ensure personalised treatment tailored towards disease characteristics, while also ensuring that drug costs do not spiral through the inappropriate use of triple therapy. It is likely that a local education programme for GPs and practice nurses to share the formulary choices and updated GOLD guidance will help deliver better patient outcomes. van der Molen T. Clinical COPD Questionnaire. 1999. Available at: ccq.nl (accessed 25 November 2014). Burge S, Wedzicha J. COPD exacerbations: definitions and classifications. Eur Respir J 2003; 21: (Suppl. 41): 46s–53s. Hurst J, Vestbo J, Anzueto A et al for the Evaluation of COPD Longitudinally to Identify Predictive Surrogate Endpoints (ECLIPSE) Investigators. Susceptibility to exacerbation in chronic obstructive pulmonary disease. N Engl J Med 363: 1128–1138. Soler-Cataluña J, Martínez-Garcia M, Román Sánchez P et al. Severe acute exacerbations and mortality in patients with chronic obstructive pulmonary disease. Thorax 2005; 60: 925–931. Calverley P, Anderson J, Celli B et al for the TORCH investigators. Salmeterol and fluticasone propionate and survival in chronic obstructive pulmonary disease. N Engl J Med 2007; 356 (8): 775–789. Tashkin D, Fabbri L. Long-acting beta-agonists in the management of chronic obstructive pulmonary disease: current and future agents. Respir Res 2010; 11: 149–162. Tashkin D, Celli B, Senn S et al for the UPLIFT study investigators. A 4-year trial of tiotropium in chronic obstructive pulmonary disease. N Engl J Med 2008; 359 (15): 1543–1554. Vogelmeier C, Hederer B, Glaab T et al for the POET-COPD investigators. Tiotropium versus salmeterol for the prevention of exacerbations of COPD. N Engl J Med 2011; 364 (12): 1093–1103. Calverley P, Pauwels R, Vestbo J et al; TRial of Inhaled STeroids ANd long-acting beta2 agonists study group. Combined salmeterol and fluticasone in the treatment of chronic obstructive pulmonary disease: a randomised controlled trial. Lancet 2003; 361 (9356): 449–456. Kerwin E, Hébert J, Gallagher N et al. Efficacy and safety of NVA237 versus placebo and tiotropium in patients with COPD: the GLOW2 study. Eur Respir J 2012; 40 (5): 1106–1114. Wise R, Anzueto A, Cotton D et al for the TIOSPIR Investigators. Tiotripium Respimat Inhaler and the risk of death in COPD. N Engl J Med 2013; 369 (16): 1491–1501.